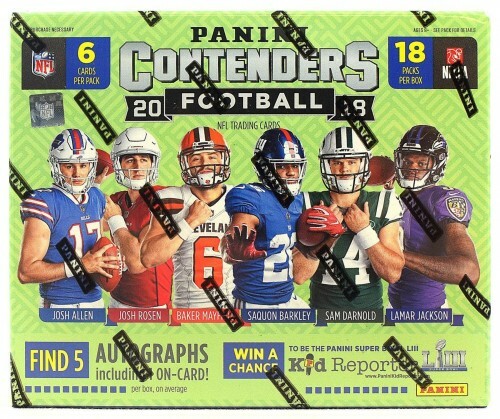 Every Box of 2018 Panini Contenders contains at least Five Autographs, One Parallel, and 18 Inserts! Find One On-Card Autograph Per Box! The iconic Rookie Ticket is back again and features all the top rookies the NFL has to offer, these parallel to Playoff Ticket (max #'d /99), Championship Ticket (max #'d /49), Cracked Ice Ticket (#'d /24), and Super Bowl Ticket (#'d 1/1). Chase Rookie Ticket Variations, which features unique design elements and unique photography from the standard Rookie Tickets. New to 2018 Contenders is the die-cut Rookie Ticket Stub (#'d/99 or less) parallel and the acetate Rookie Clear Ticket (#'d /10) parallel, find these in the rookie ticket and variation sets. Exclusive to the hobby look for Golden and Silver Tickets of the stars and top rookies the NFL has to offer. 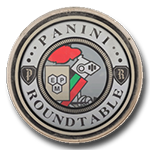 Look for inserts: Rookie of the Year Contenders, MVP Contenders, Legendary Contenders, Team Quads, and Round Numbers. ROOKIE TICKET RPS: One of the most sought-after cards of the year the Rookie Ticket RPS brings a vibrant design with bold on-card autographs of all the top rookies. : New to 2018 Contenders is the Rookie Ticket Stub RPS, which is a short-printed parallel and includes a die-cut on the top edge to simulate a torn ticket stub. ROOKIE CLEAR TICKET RPS: Another new twist to the Rookie Ticket is the Rookie Clear Ticket RPS, which is printed of clear acetate and includes an on-card autograph of the top rookies in the NFL. GOLDEN TICKET: Hunt for the 14k gold 1/1 Golden Tickets of the top veterans and rookies. Also look for the Silver Tickets, which are limited to only 2 copies. MVP CONTENDERS AUTOGRAPHS: Look for the game breakers of the NFL in the MVP Contenders Autograph set. Chase these #'d/49 or less with Gold (#'d/10) and Platinum (1/1) parallels! ROOKIE OF THE YEAR CONTENDERS AUTOGRAPHS: Find autographs of rookies that are poised for breakout seasons with Rookie of the Year Contenders (#'d/99 or less). Also look for the Gold (#'d/10) and Platinum (1/1) parallels! 20TH ANNIVERSARY ROOKIE TICKET RPS: Paying homage to Contenders Rookie Tickets of years past with the 20th Anniversary Rookie Ticket RPS, which features on-card autographs. CONTENDERS TO CANTON AUTOGRAPHS: From one of their first Contenders Tickets to being enshrined in the Hall of Fame, these cards capture both iconic moments #'d/20! ROUND NUMBERS DUAL AUTOGRAPHS: Round Numbers Dual Autographs pairs players from the 2018 NFL Draft that were drafted in the same round as each other.